Bono of U2's despairing complaint "Peace On Earth" perhaps summarizes the horrific conclusion to the life of Cho Seung-Hui, perpetrator of the Virginia Tech massacre. While there is plenty of reason to presume that Cho was mentally ill it is perhaps a more reassuring conclusion than this one - Cho was an evil monster. But was Cho a "born monster"? Was he a "bad seed" who was destined to end his life as a mass murderer? Or did Cho, as Bono's song goes, "become a monster so the monster will not break you"? In Cho's videotaped diatribe that he mailed to NBC he made some statements that sounded to me like quotes from movies or books. My guess was that many of his strange statements were excerpts of "hot phrases" he had acquired over the years and not original. One of Cho's raging comments, "The decision was yours" struck me as such a phrase. Apparently I misheard Cho and typed in a Google search for "The Decision Is Yours" instead. That yielded the rather shocking result you see displayed above when I clicked on a listing for a book on Amazon.com. 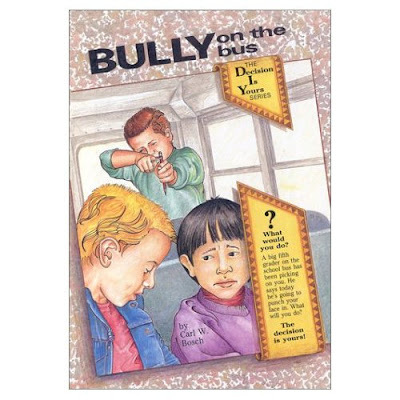 The book cover is from "Bully on the Bus" which is part of a book series displayed on the book cover - "The Decision Is Yours". While a book about a kid bullied on a bus isn't exactly ground-breaking news, I found the image of an apparently Asian child with a large question mark beside his head startling. We know that Cho referred to himself as "Question Mark" and that he even signed in on the first day of one class at VA Tech with nothing other than the symbol, "?" instead of signing his name. This incident earned Cho the title amongst fellow students of "The question mark kid". Cho apparently embraced this moniker and according to his roommates cultivated an "alter-ego" called "Question Mark". One VA Tech female student believes Cho used the symbol in a stalking incident and one roomate claims Cho made prank calls claiming to be "Question Mark". I like this book and the others in the Decision is Yours Series. In this story, a boy encounters a a peer who threatens him verbally and physically. The reader can create many different scenarios by choosing different actions. Once the reader chooses an action, he goes to the appropriate page. The story changes based on each decision. Kids can see what might happen if they choose to be assertive, aggressive or submissive. Then they can go back and try it again another way. Many of us have wished that we could redo our own life decisions. I have used this book with individual children and young adolescents. I have also used it with groups. Often a child or adolescent who has been victimized has trouble thinking of different options. This book can open up possibilities. It provides realistic positive and negative consequences. The reader can see that certain actions might end you up in the principal's office. Other actions might lead to new sources of social support. I would recommend this book for elementary and middle schools, to therapists, and to children who are bullied. The words of Ms. Watkins hit me hard - "Many of us have wished that we could redo our own life decisions" and "Often a child or adolescent who has been victimized has trouble thinking of different options." As I write CNN is airing a report from a childhood neighbor of Cho's who freely admits that Cho was bullied and ridiculed. Cho is referred to as "an easy target". Other reports have stated that Cho was bullied in Middle School. It also appears that by the time Cho had reached High School he had solidified the silent loner personna that he held until his shocking conversion to a ranting mass murderer. When Cho was forced to speak in a high school class when a teacher had students take turns reading outloud he was met with mocking disdain as classmates told him to "go back to China" [note the link isn't directly related to Cho - just an example of how racial hatred for many is great entertainment]. I'm sure this is just one of many stories that could be told about the humiliation that Cho endured. Does this explain his crimes? Am I trying to defend his actions? No. And no. I will leave the deeper analysis to the "professionals" but it just seems to me that "The Question Mark Kid" was bullied by monsters, and then became one. Cho absorbed years of evil hatred and then became evil incarnate. In Cho's words he "ran out of options". But Cho turned "The Decision Is Yours" to the "The Decision WAS Yours" and then the monster broke him and shattered 32 lives, a school, and a nation. Great post! Although I don't think I have as much faith in child psychology as you do. Psychology in so ingrained in the public school system that if they had designed a faulty system that does not reflect the way kids actually behave, they'd never know it, because they take the system as the standard by which to measure children. We need to stop listening to professionals so much and start holding them responsible for the system they created. They are, necessarily, part of the problem, even if they have solutions. Thanks and good point, Jeremy. I wasn't intending to claim that the social services system or psychology was the answer. Mister Contrary is coming to dinner. Ladies and gentleman grab your forks.